For those of you that have been eyeing the Klim lineup but needed something that fits a little slimmer - feast your eyes on the Klim Kodiak Pants. New for 2017, the Klim Kodiak Pants are the complement to the matching Klim Kodiak Jacket - and the answer to your adventure needs! 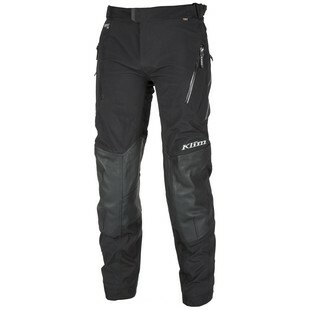 The Klim Kodiak Pants offer you the protection of the Klim Badlands Pants, but without all the bulk. This tailored fit is going to make a big different for riders more focused on the road and not the dirt. While the protection will certainly be everything any Dual Sport rider is looking for, I think the slim cut is going to be the biggest appeal for anyone logging a lot of miles on the road. The Klim Kodiak Pants feature the same Gore-Tex Pro Shell we all know and love and CE Level 2 D3O in the knees and hips. As a bonus, you also get Poron XRD tailbone coverage. If you have ever broken your tailbone (believe me, you don’t want to), this added coverage is great to have. Similar to the Badlands, you will find that these pants have 2 intake vents and exhaust vents on the front and back of the thighs but that is where the similarities end. The Kodiak features perforated leather on the knees rather than the heavy Superfabric you would find on the Badlands. Top it all off with the included removable suspenders and you have got one powerhouse of a contender for the top of the Klim adventure suit line-up... except for you, Adventure Rally. No one will beat you boo, you are still King! Really great to see Klim take what they know riders love and also show that they are listening to what riders need. Keep it up guys!